A Die Hard Debate: Action or Christmas Movie? Is “Die Hard” a Christmas movie or an action movie? Despite best intentions, Willis’ declaration has definitely NOT stopped the debate. New York Police Department Detective John McClane (Willis) arrives in Los Angeles on Christmas Eve, immediately going to see his estranged wife at her office holiday party at the Nakatomi Plaza. The situation quickly takes a turn for the worst when a group of international terrorists, led by the charismatic Hans Gruber (Alan Rickman), take Holly McClane and her coworkers hostage. Barefoot and clad in a white tank top and slacks, McClane manages to escape by slipping into the building’s maintenance areas. Throughout the course of the film, McClane manages to befriend a beat cop, swear at the local and federal authorities over CB radio repeatedly, blow up parts of the Nakatomi Building, take out the entire terrorist group, AND save his wife. Despite what Willis said, it seems there are some strong parallels between holiday flicks and this particular action film. While the plot revolves around Christmas Eve, Die Hard was originally released in theaters in July of 1988 as a summer action blockbuster. Therefore, some argue the marketing of the film positioned it as an action movie, as opposed to another White Christmas. Others simply think it’s too violent. At the same time, one of the central themes of the movie is McClane flying to Los Angeles to save his marriage and see his two children for the holidays. Christmas music is featured throughout the film, including the liberal use of Beethoven’s “Ode to Joy” and “Let It Snow” at the end. 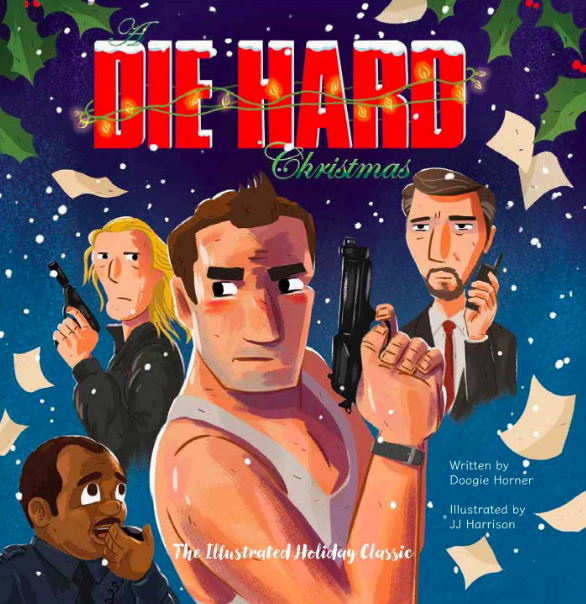 If you haven’t read the book A Die Hard Christmas, written by Doogie Horner and illustrated by JJ Harrison, you are missing out! It’s a mash-up of Die Hard and the childhood classic Twas’ the Night Before Christmas by Clement C. Moore. If this book doesn’t scream holiday classic to you, then nothing will!